Altbier (old beer) is a wonderfully complex beer that is brewed in Dusseldorf, Germany. Locals consume this magical beer by the thousands of barrels per year. In fact, it would take a brave person to ask for anything else but Altbier in Dusseldorf! Light copper to light brown, very clear from lagering, white to off white head with good retention makes this fairly bitter beer a unique standout. Having a malty, biscuit and/or light caramel flavor with a dry finish makes this a very special brew. So, enjoy a glass or two imagining your’re in the atstadt on a spring day enjoying a truly local German beer! Best Selling Kit: As of this posting, the all grain version of this kit is Keg Connection’s best selling kit. That can change, check this search for current standings. HBF Reader Coupon! As of this posting, coupon code HBF5OFF takes an additional 5% off. 5% usually wouldn’t be too great of a discount in an of itself. The reason it’s outstanding in this case is that it stacks with some of the best homebrew keg deals available. This sweetens some already great deals to make some outstanding deals. That makes this kit just $22.75. 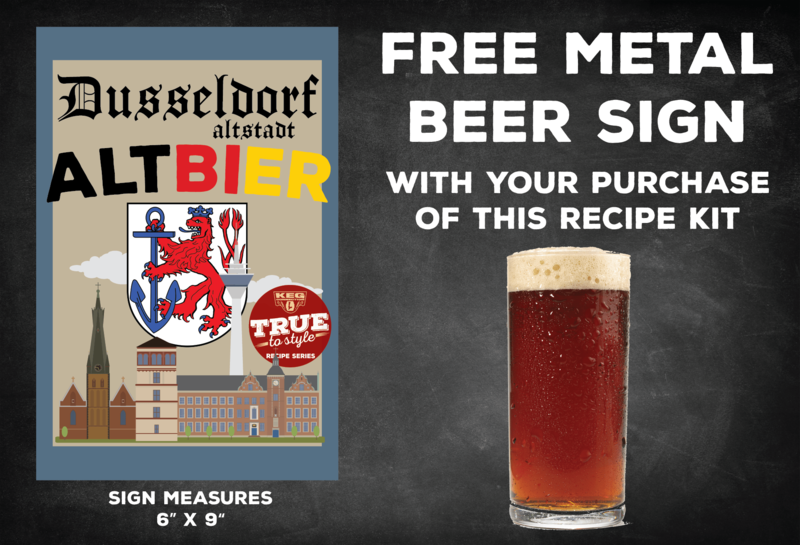 This entry was posted in German Beers, Great Deals, Keg Connection, Kits, Recipes on April 26, 2019 by admin. 4/22/19 3 PM Central: This has dropped to $12.73. That’s the best historical direct from Amazon price I found, notwithstanding Lighting Deals or coupons. Shipping is also free to many US addresses. Prices, shipping and availability can change quickly. Please note that product prices and availability are subject to change. Prices and availability were accurate at the time this post was published; however, they may differ from those you see when you visit Amazon. Check the product page for current price, description and availability. This entry was posted in Amazon, Amz, Books, German Beers, Great Deals on April 22, 2019 by admin. As of this posting Keg Connection is taking a generous 20% off their entire lineup of recipe kits. This is off already, generally good prices. Note: many of Keg Connection’s kits… come with White Labs yeast. That’s pretty rare these days and something that should be factored in when you’re considering price. Also, shipping is a flat $7.95 no matter how much you order – including kegs and such to addresses in the contiguous 48 US States. Price, promotions and availability can change quickly. Please note that product prices and availability are subject to change. Prices and availability were accurate at the time this post was published; however, they may differ from those you see when you visit the product page. Check Keg Connection current price, description and availability. This entry was posted in German Beers, Great Deals, Keg Connection, Kits, Recipes on February 17, 2019 by admin. This entry was posted in Amazon, Books, German Beers on September 30, 2018 by admin.